Tired of a messy garden? Hate having your tools or spare plant pots lying around the garden? Sick of tripping over kids' garden toys? Then you need one of our Utilis Garden Stores to keep things neat and tidy. Our garden stores come with a mineral pent roof and opening doors, designed to keep all your garden clutter dry and out of sight. Doors lock, so you don't need to worry about theft, and internal shelves mean it's easy to store everything that you need. Plus, you won't need to find space for a full-sized tool shed. Why Buy a Wooden Garden Storage Chest? Trimming hedges, sweeping the patio, mowing the lawn and turning over the soil. 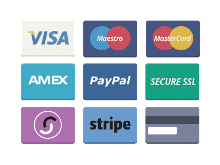 These are all necessary jobs if you have any sort of garden and they all require tools to complete. But where can you store all those tools, plants pots and even toys if you have young children? If you don't have the luxury of a roomy garage or space for a large walk-in shed, then our Utilis Garden Storage cupboards are ideal. 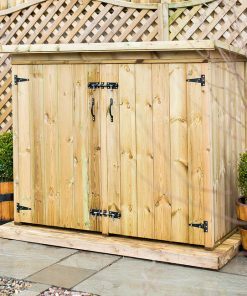 Whether you just want to spruce up your garden or secure your tools and other accessories our garden stores are a great option to provide a large amount of storage space whilst taking up a small footprint in your garden. 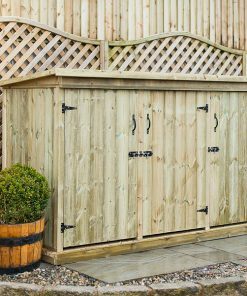 Whether you have a large winding garden or just a small courtyard patio, our garden storage units work well in a wide range of settings. Although they do excel in smaller gardens that don't have a huge amount of space. New builds and urban gardens often have limited floor space so a smaller wooden garden store is a perfect alternative to a larger shed. Our garden storage cabinets are made from pressure treated timber and come in double and triple sizes. They look great when left natural but they can easily be painted and modified to match other fixtures in the garden. Whether you paint the store or not, we do recommend adding a coat of stain once a year for longevity. Our garden stores aren't designed to be moved once assembled (we recommend anchoring them to the floor with our floor fixing it) so you do need to consider where it's going to sit and planning ahead is essential. If you are going to using the storage shed often, then you need to make sure it's accessible. You won’t want to have to traipse to the end of the garden across a muddy lawn, especially over the winter months. Focal Point or Purely Practical? Is your shed going to take pride of place or would you prefer it tucked away out of sight? Our garden stores are made in a tongue and groove style and from planed square edge timber so they work well in prominent locations. We recommend installing it in an under-utilised, shady area rather than taking up prime real estate that catches the sun. When you receive your Utilis Garden Storage Unit, it will have a green colour, this is due to the tanalith and once exposed to sunlight it will turn into a golden brown colour. Don't paint the wood immediately, you should wait until the tanalith has oxidised and the moisture content in the wood has matched the environment in your garden. We recommend treating the store once a year with a wood stain to prolong life. Although if you want to change the look completely you can give it a lick of paint with an exterior-grade timber paint. Dark grey is hugely popular right now as it helps the garden shed blend into the background and also compliments surrounding planting. If you've got a garden then chances are that you've also got a ton of garden tools, pots and toys. And that's why you need a cupboard style tool shed. You'll have the neatest garden in the neighbourhood, and you'll never worry about rusty tools or stolen toys again.